Here's the first Alphabet Challenge Revisited post of 2014. 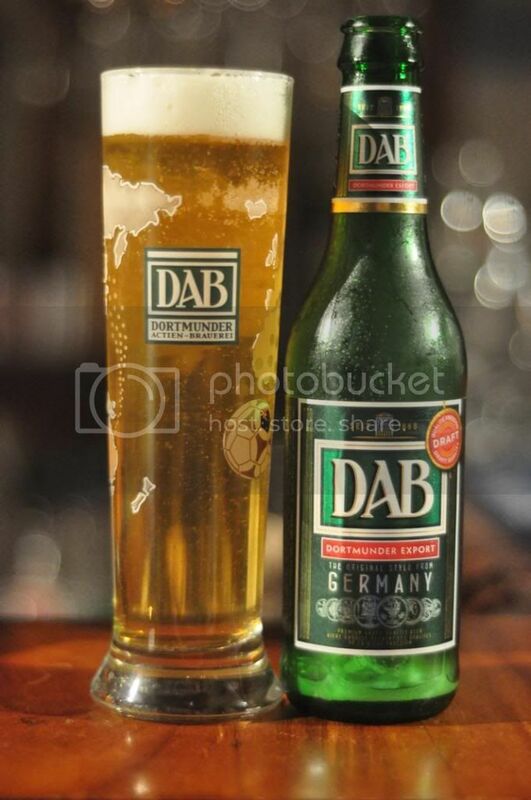 Today we up to D; DAB - short for Dortmund Actien Brauerei (Dortmund Joint Stock Brewery). The brewery is nearing it's 150th birthday and has been producing a Dortmunder similar to this for most of it's history. This thin pilsner glass shows off DAB much better than the willybecher (German pint glass) that I used in my last review. The colour is deep golden and has a relatively small head of thick white foam. There are plenty of small carbonation bubbles rising to the aforementioned head, which help give it excellent retention and provides nice lacing. It's a stereotypical looking Dortmunder. Harking back to what I said in the original Alphabet Challenge, this is hardly a spectacular lager, but it certainly is crisp. There's plenty of malt initially which is slowly replaced by grassy and lightly citrussy hop flavours. It's well balanced for the style and has enough carbonation for the beer to feel spritzy without being over carbonated. The finish is lovely and dry which really improves the drinkability in my opinion. In the three years since I drank this initially for the original Alphabet Challenge, not only has my palate evolved but so has the price; I think Dan's had this at $20 a 6-pack! So it's still a good drinking beer but it is in no way a world beater. Thankfully it's regularly available and it's still a beer that I pick up semi-regularly to drink with lager drinkers. It's one of those beers that all beer drinkers should try at least once.